Matt said Wix should have provided proper attribution to WordPress for the code used in the mobile app. Abrahami does not address this. Yes, Wix has released over 200 Open Source projects on Github, but doing a good thing doesn’t reconcile doing a not-good thing. If the license says they need to provide attribution, they should address that specific issue for this specific piece of software. Matt states that if a piece of software includes any components from other GPL software, that makes the whole new piece of software GPL and it should therefore be made public if distributed (which the mobile app was). This is indeed the case, and it is not addressed in Abrahami’s response. Releasing partial components on Github is not enough. There’s something about Abrahami’s tone in his email that irks me. Maybe it’s how he calls Matt “dude” and says “I didn’t know we were fighting”. You’re not fighting so don’t make it into a fight: Matt wants you to do what he thinks is right. Maybe it’s how he tries to deflect accusations of brand-stealing by saying that WordPress has shifted from being only about blogs to being about websites too – I mean, what? Is he saying that Wix has sole ownership of the website-building space and Automattic stole that from them? A company is allowed to expand its focus for goodness sake. Maybe it’s how he invites Matt to coffee, which is a poor reading of a serious situation. If you think someone ripped off your stuff, you may not feel like getting together with them for coffee…probably more like a court of law. Also, why didn’t he link to Matt’s original post?! That’s a rhetorical question, but it looks shady. I think it would have been better for the company to have publicized the response by the engineer responsible for the mobile app that Abrahami links to in his post. It addresses the issues in a less…um…passive-aggressive dude-filled way and he shows how he tried to collaborate and share with Automattic’s engineering team. It still doesn’t provide satisfactory answers to the issues at hand, but it’s easier to digest. https://twitter.com/stratticweb/status/790832690287087616. It also seems that the Apple Store does not allow GPL code-based apps since the app store’s protections negate the GPL license. So yikes. Don’t respond to issues immediately, and especially not over the weekend. Matt posted on Friday, and Abrahami posted on Saturday. People are taking a break over the weekend, there’s no rush! It seems that Abrahami wrote in the heat of the moment. He probably should have first had his legal team review the situation, and if necessary, apologize, remove the app from the app store, remove the GPL code and re-release it; OR keep the GPL code, add attribution, and publicly distribute it. In general, your legal/PR/marketing team isn’t working at full capacity on Saturday/Shabbat, so wait until they get to work, review the issues calmly, and then respond. No one’s going anywhere. Make sure you have people on your team who understand the nuances of other cultures. What’s interesting is that many of my Israeli Facebook hi-tech friends are commending Abrahami on his post. As a grew-up-in-Canada person, I’m cringing when I read it, and I’m not the only one. If you are a non-American company, make sure you have an Anglo on your PR team who has a better grasp of what kinds of tones and intonations work well outside of Israel. We Israelis have a very direct way of communicating, and while that can be great at times, it’s definitely not always great. Look, Matt’s approach to GPL can come across as zealous. And the GPL has never been tried in an American court of law, so it’s not clear that Matt is right about everything in this case (or other cases). And it’s also possible that Wix made an innocent mistake. Open Source licensing can be confusing and unclear. I’m sure there’s a way to resolve this quickly and painlessly. In the future though, all hi-tech companies should strive to increase awareness of what Open Source means, have decent legal counsel, and a good PR team that reacts thoughtfully to branding and legal crises. Exactly what I thought of Avishai replies. This is why there are no big israeli internet companies. It is not the lack of talent or knowledge but the understanding that most of the world do not do things the israeli way. The reply was too soon, it had to be first consulted by a lawyer and written by a PR department with people that understand the way Americans express themselves especially when they are upset and what kind of reply they expect. As for GPL not being in court in the US… first I am not sure about that at all, but even them it is a simple matter of copyright law. You need explicit license to use someone else’s code and if you disobey the license you are not allowed to use the code. This is true for all code everywhere and IIRC in places like google they will just avoid using any external libraries in their code no matter what is their license. This just exposes the lack of legal oversight in Wix over the code, which is probably related to the fact that most of their code is server side and therefor do not need to obey the redistribution requirements of the various licenses. IOS apps are a different beast. Spot on. The tone was very unsettling. Abrahami sounds like he isn’t taking this seriously. Honestly, I’m not surprised how Matt called them out. He comes from older blog days, and we did this so people got a wake up call, and made it right. No legal team needed, just people admitting and fixing the problem. This is making something out of nothing. If there’s a legal issue re: GPL, let your lawyers handle it (or at least get their advice before publicly commenting about it). As far as the informal tone, that’s pretty much expected from this crowd. These are developers by trade, mostly young, and not polished global executives with MBAs or attorneys. They’re used to communicating on Twitter. WIX actually started out as WIX – Web Information eXchange by IBS (Internet Business Services). Internet Business Services provides low cost Internet solutions for both small & large businesses. We strive for excellence in both products and services. We provide ideal solutions to take your business to the next level. We’ve built a team of professionals who provide a broad range of services to help your business utilize current technology the best it can. EzHoster – The E-Z way to get your site published on the internet. An entry level service for businesses seeking to explore Internet related services, but have neither the time nor expertise to setup there own server. This is an ideal service for those wishing to try Internet advertisement and customer service. High Performance, Low Cost, LINUX/UnixWare Systems. Leverage our seven years of LINUX, and fifteen years of UNIX experience to build yourself the ultimate workstation. We have teamed with Computer Management Corporation (CMC) to bring you fully configured, tested, and guaranteed systems. At Internet Business Services we attribute a great deal of our continued success to our dedication to customer satisfaction. We provide the expertise and services to enable your company to conduct business and succeed on the internet. We use the latest internet technologies enabling us to develop a world-class internet site for your business. Our skills and expertise cover a broad range of services from site design and content to critical e-commerce transaction processing. Internet Business Services is dedicated to providing its clients with products and services of the very highest quality. Our team constantly strives to ensure that the stability and reliability of our products is maintained to the very highest levels. Only by providing the best possible solutions can we expect our clients to achieve the best possible results. If we’re going to throw around accusations for the benefit of accuracy, let’s at last be accurate. PS: Otherwise a very sage post. 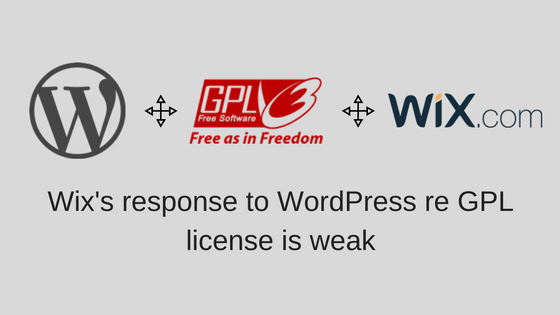 wix violates wordpress GPL. Matt mullen is really a good honest man and she explained everything clearly on his blog. Nice article, WordPress has offered so much opportunities to developers and designers, professionals are literally making a living from it. I’ve been following Wix for a long time, they spend a fortune on advertising and use some aggressive/intrusive marketing techniques and it’s no wonder that they cheated here. I totally agree with Matt, if you’re using open source code then license your product appropriately and give back to the community. This is how it works, WordPress is powered by a community of enthusiasts, so why not giving credit to them.